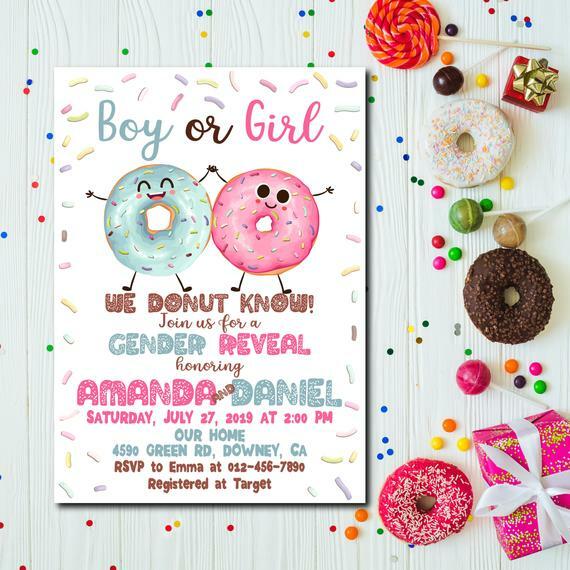 We've rounded up the best gender reveal baby shower invitations we could find for the most popular party themes. Hopefully, helping you if your still uncertain with which theme to go with! 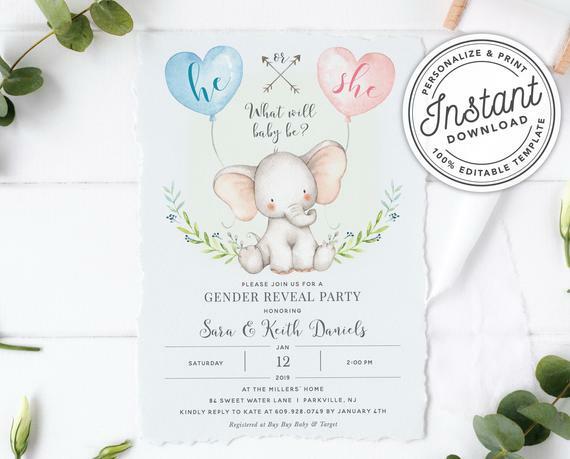 You'll find the cutest gender reveal invitations for a wide variety of baby shower themes such as a rustic gender reveal baby shower, a bumble bee gender reveal baby shower, a tropical gender reveal baby shower and so so many more... so, put your feet up and enjoy! 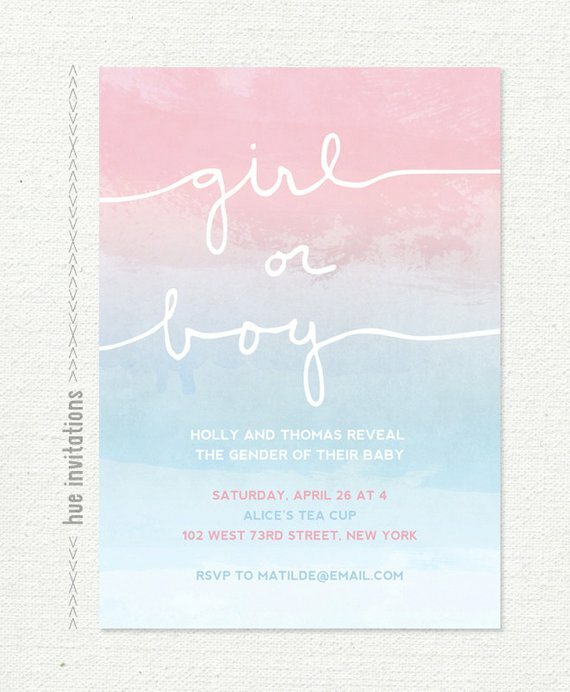 To start off our list of gender reveal baby shower invitations we have a very simple but gorgeous pink and blue watercolor design. Don't panic if you haven't yet figured out your baby shower theme. This design is very generic and solves the problem of getting invitations out until you've decided. Rustic baby showers are very very popular at the moment and work just as well for a boy or a girl. 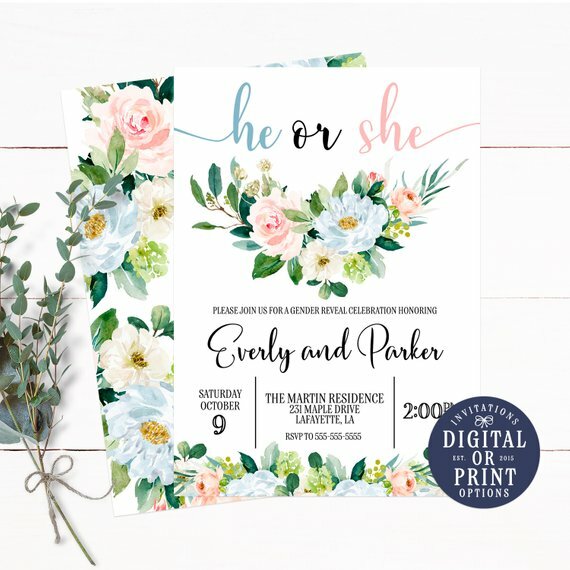 This floral gender reveal invitation is so beautiful and looks amazing if you're planning a summer or spring baby shower! Woodland themed baby showers are adorable. Who can resist all the cute little woodland animals? They sure do melt my heart. 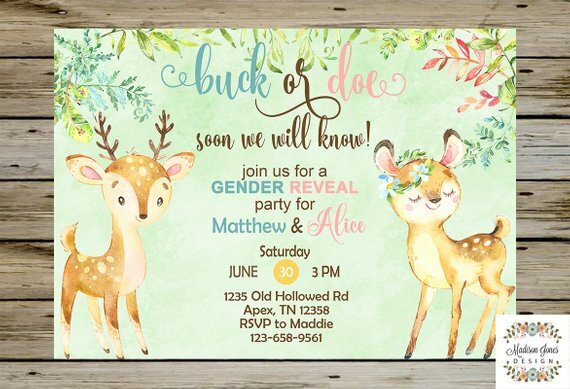 So, this 'buck or doe' invitation is perfect if you're going with a woodland themed gender reveal! Another cute animal that keeps popping up, and that is becoming an increasingly popular baby shower theme, are elephants. Perfect, if you're as excited as we are about the live action Dumbo movie that's coming out this year. 'What will he or she be' is the question on everyone's lips at your gender reveal, so why not have fun and go with a bumble bee theme?! 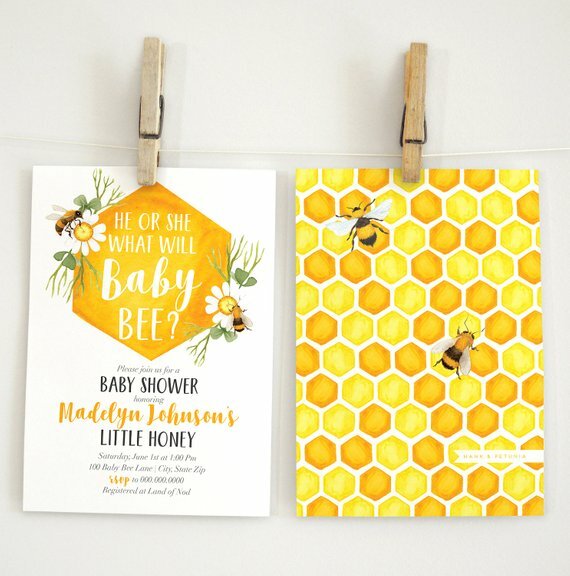 Contrary to pink and blue, yellow is universally know as a gender free color which fits in perfectly with a bee themed baby shower, don't you think? The perfect theme for a gender reveal baby sprinkle would have to be a raindrop one! 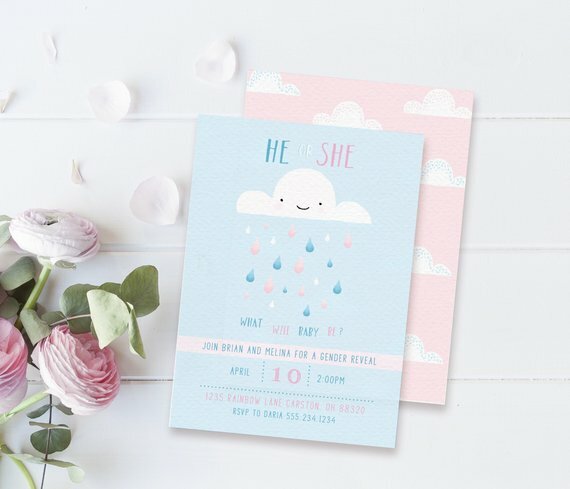 This cloud and raindrop invitation is just so lovely! Who can resist the smile on the clouds face?! 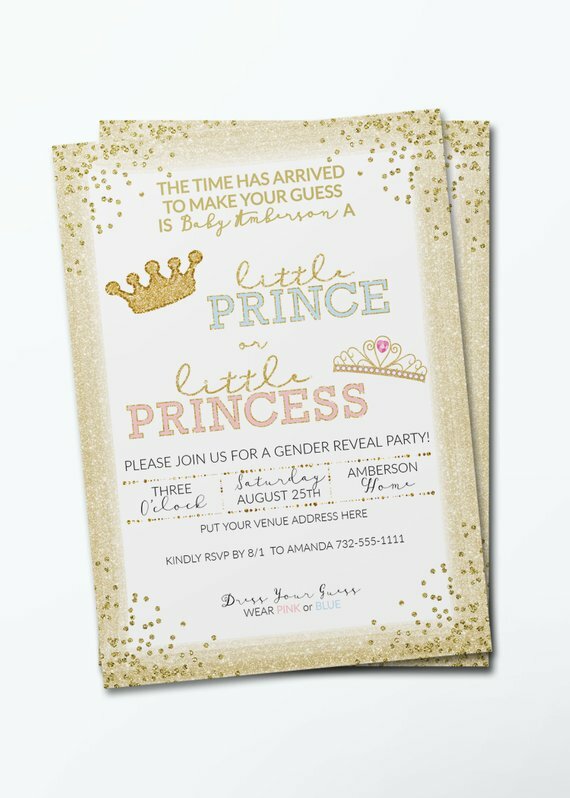 Prince and princess baby shower are one of the most popular themes on CatchMyParty, so you can't really go wrong with a 'little prince or princess' gender reveal. This invitation is so pretty with the cute crowns. Your guests are going to love it! 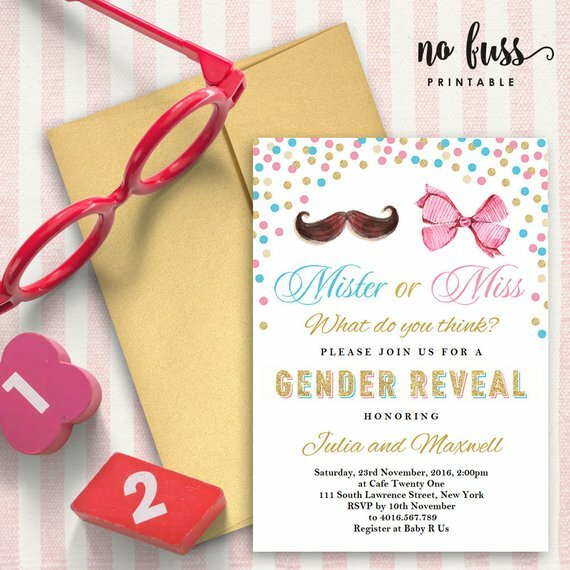 You can also keep your guests guessing with a 'mister or miss' gender reveal theme. This invitation with a little mustache and little pink bow is perfect! 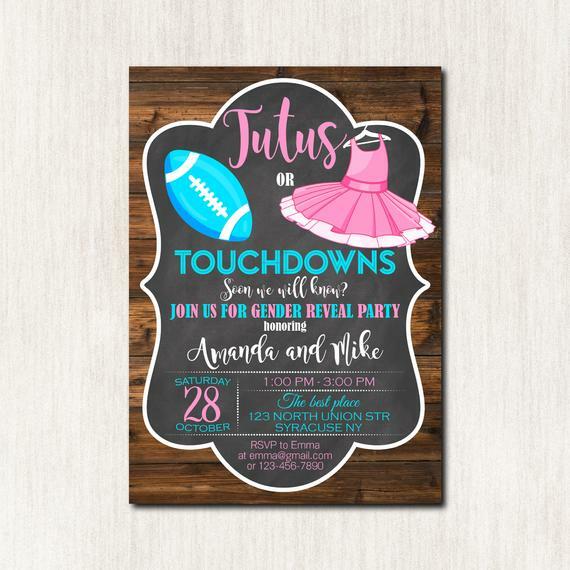 If you're husband is into football and your more of a ballerina, then a touchdown and tutu invitation is just what your are looking for! The illustrations on the invitation are gorgeous and you'll have your guests setting bets the second they set there eyes on it! 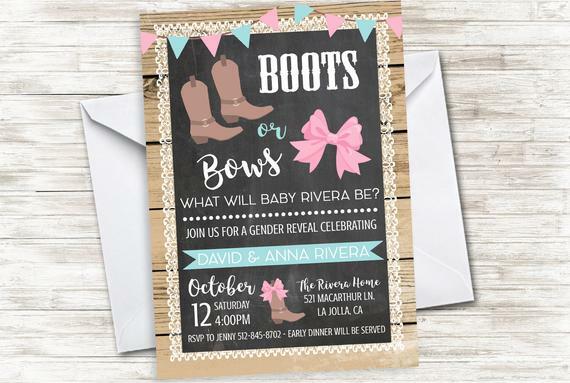 Similar to the previous gender reveal invitations, another cool theme for a baby shower is a country one. Have your guests guessing between some boots or a bow! A Boho chic theme is popular whatever the party! They are so whimsical and free-spirited and are perfect if you love nature! 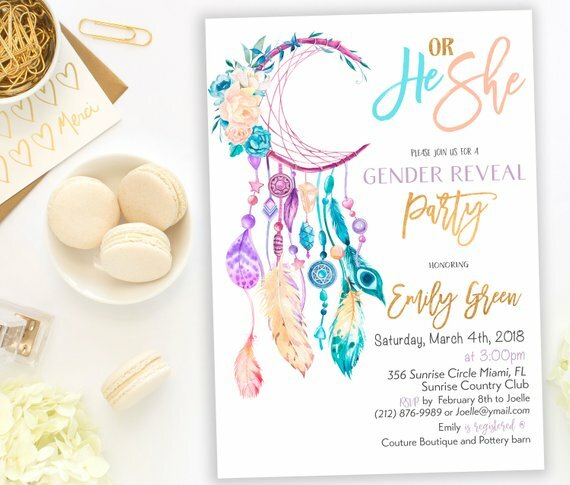 This gender reveal invitation is fantastic with the gorgeously illustrated dreamcatcher. Love the colors. If your baby is due in the summer then a tropical theme is what you need. You can go with either a luau, flamingo, llama or pineapple theme. All really popular and sure to be a hit with your guests! 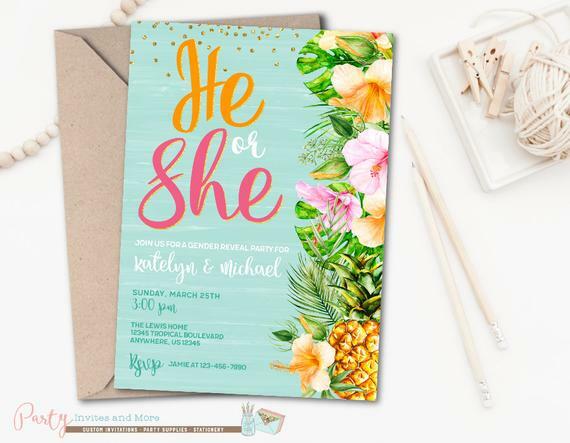 Set the mood for your gender reveal with this invitations that just oozes the sun! You can almost feel the heat on your face! Seen as the 'mom to be' is ready to pop, what could be more fun than a popsicle themed gender reveal? 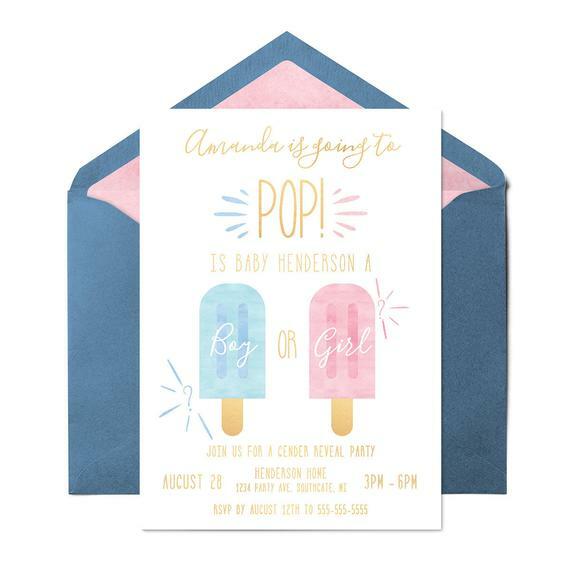 This invitation with a pink and blue popsicle is also perfect if your planning a baby shower in spring or summer. Donut parties are all the craze at the moment, and just like babies, no one can resist a donut! You can't really go wrong with this gender reveal invitation. The little boy and girl donuts are too sweet! 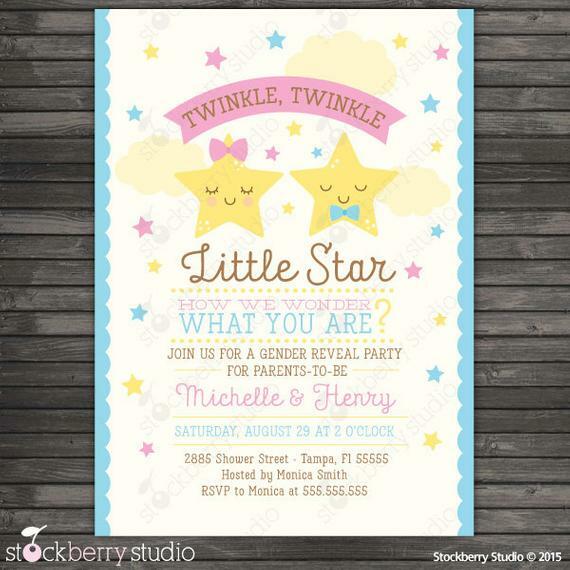 To finish off your list we have a twinkle twinkle little star gender reveal invitation. The two little stars are just so adorable and are a wonderful way to set the mood for what will be a gender reveal to remember! 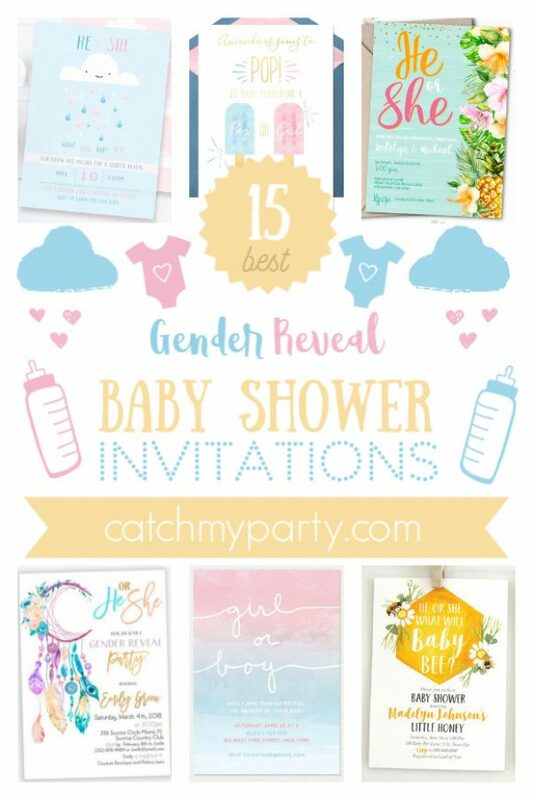 Need free baby shower party printable decorations?